The landfall and subsequent flooding from Tropical Cyclone Idai, which struck Mozambique, Malawi and Zimbabwe last week, "risks being one of the deadliest weather-related disasters in the Southern Hemisphere," Clare Nullis, the spokesperson for the World Meteorological Organization, a UN agency, tells Axios. The big picture: The storm made landfall as the equivalent of a Category 3 storm near Mozambique's fourth-largest city of Beira on Thursday. At least 1,000 people are believed to have died in Mozambique with thousands more injured, while officials estimate that as many as 1.5 million are at risk of water-borne diseases, starvation or other impacts from the inland flooding due to the storm. Reports from aid groups and the Mozambique government show that at least 90% of Beira and its surrounding areas is now submerged. “The first thing you see when you arrive is destruction — and a lot of water. We hear that the situation outside the town may be even worse. But in the limited time since we arrived, we’ve focused on trying to understand the situation and needs in this city, as there are some 500,000 people who live here and most houses are damaged or destroyed. Details: The warnings from aid groups and governments grew more urgent on Tuesday as the massive scope of the disaster became clear. For example, UNICEF warned that the damage to water and sanitation infrastructure will bring great risk of water-born diseases and limit access to safe drinking water. The organization is hoping to raise $20.3 million to support relief efforts. The European Commission announced it will release an emergency aid package of about $4 million to the countries affected by Idai. Zimbabwe's treasury is already planning to release $50 million for emergency infrastructure restoration. Nullis said the storm could rank at the top of the deadliest weather disasters list if the figures coming from Mozambique's government and aid groups turn out to be true. "We have to be careful with figures and different databases — and also whether all flooding deaths are related to the cyclone. We are not trying to compare it to slow onset related climate disasters, like El Niño triggered droughts," she added. The state of play: It's been difficult to fully assess the damage and number of casualties in Mozambique because communication lines are down and many main roads have been destroyed. Context: Mozambique does occasionally get struck by tropical cyclones. Typically, the presence of the large and rugged island of Madagascar to the east of Mozambique weakens such storms before they hit the country. However, in this case, Idai was able to intensify rapidly in between Madagascar and Mozambique due to light wind shear aloft and warm ocean waters. While studies do show climate change-related trends in tropical cyclone intensity and rainfall amounts in parts of the world, the role climate change may have played in this disaster has not yet been analyzed. Because of warmer ocean waters and air temperatures globally, storms are able to dump higher amounts of rainfall than they did several decades ago — with such trends expected to continue. 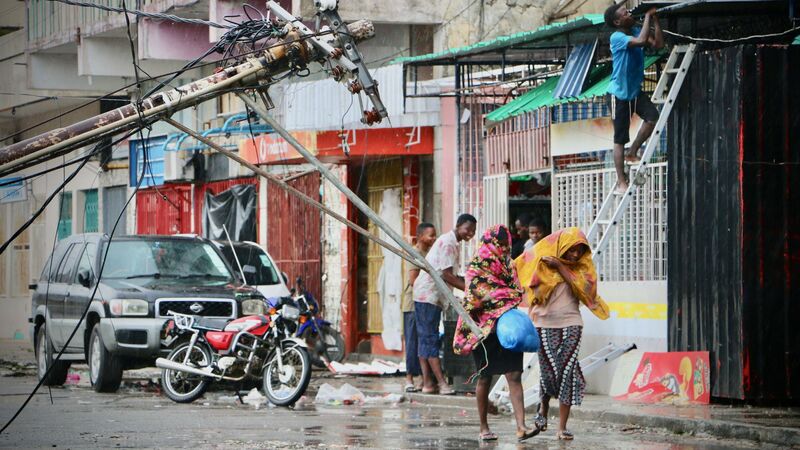 However, with this storm, the biggest factor driving up the death toll is the vulnerability of the region, given the relatively poor population and weak infrastructure that is unable to withstand powerful winds and prolonged, heavy rainfall.